The Evening Pink is an Anti-Western comprised of three parts. Shot over many Winter and Summer sessions, since 2011, the work is displayed in serial. 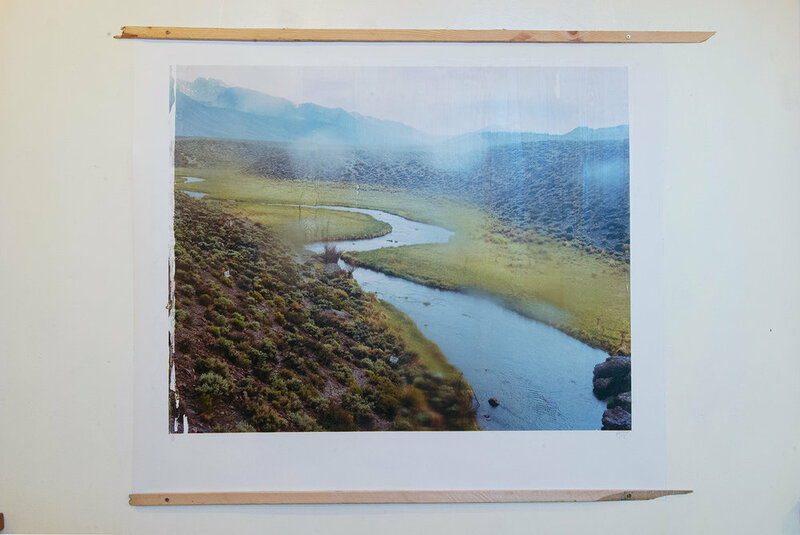 This show, Part Two - comprised of large-scale, unique, pigment-transfer photographic prints and film-based works shot between the Pacific and interior West - continues where the show in 2015 left off, pushing further into the Western genre, exploring themes of violence, nature, beauty, and the place of man in a severely affected environment. While shooting this work, a 35mm silver nitrate film (circa 1918) was found in an abandoned underground cinema in the New Mexico desert — after one year of reconditioning, Mickey will be screened for the first time on Saturday, September 17th, just after sunset. Mickey. The physical media that comprises this film was originally discovered by Desi and Randall, who you may know, or otherwise recall from the book and performance, Shock and Awe. A discovery of intuition and chance, the explosive nitrate film appeared to be crumbling to dust. Brought back to life through the relative humidity in the Bay, Mickey is a classic tale of home, and a life in the West destroyed by the invisible, merciless hands of the East Coast Millionaire Class. Originally shot in the high Gilded Age, themes of environmental and economic destruction are refracted and embodied in the media as a consequence of 98 years of decay. The result is a kind of 19th century Psychedelic Western, where the surface of the image carries the weight of time. Mickey is in one sense a link amiss in the causal chain. Dating from 1918, the remaining images on the explosive, silver nitrate stock depict scenes that could be found in the photographs in The Evening Pink. The style closely matches the transfer prints in the show. It should be noted that the title, Mickey, refers to one of the few remaining inter-titles — it is a coincidence that this is the name of the Farmstand’s creator. A mystery — the romantic image of the West, and the critique of the Gilded Age, found in Mickey, are quite at home in the exhibition, The Evening Pink. Please join us for a reception of this exhibition and a celebration and further exploration of this mysterious, psychedelic film. Ethan Rafal. An artist based in San Francisco, California., Ethan's work examines the individual and collective experience of violence and the ways that subsequent representations of violence inform personal and national mythologies. Prior bodies of work - Shock and Awe and An Ontology of Everyday Violence - function through narrative, and expectations of truth, found in the documentary style. The Evening Pink represents a departure, where concept images from dreams, nightmares, meet the world. Through these chance encounters, the Western genre becomes a playground to examine the American Mythology as it functions in the day-to-day. Regarding Process. Natural processes are invited into the production from film capture to print. Shooting exclusively on a 100-year-old large-format film camera, media is regularly exposed to rain, hail, harsh light, rendered through the slow decay of this canvas and wood machine. Often shooting after dark, the film grain reveals a structural proclivity toward red, particularly in deep shadows. Concurrent to shooting The Evening Pink, the scanner used to bring this film into the transfer printing process began to break down, revealing glitches, noise — electric feedback, organic, organized, and indiscernible. 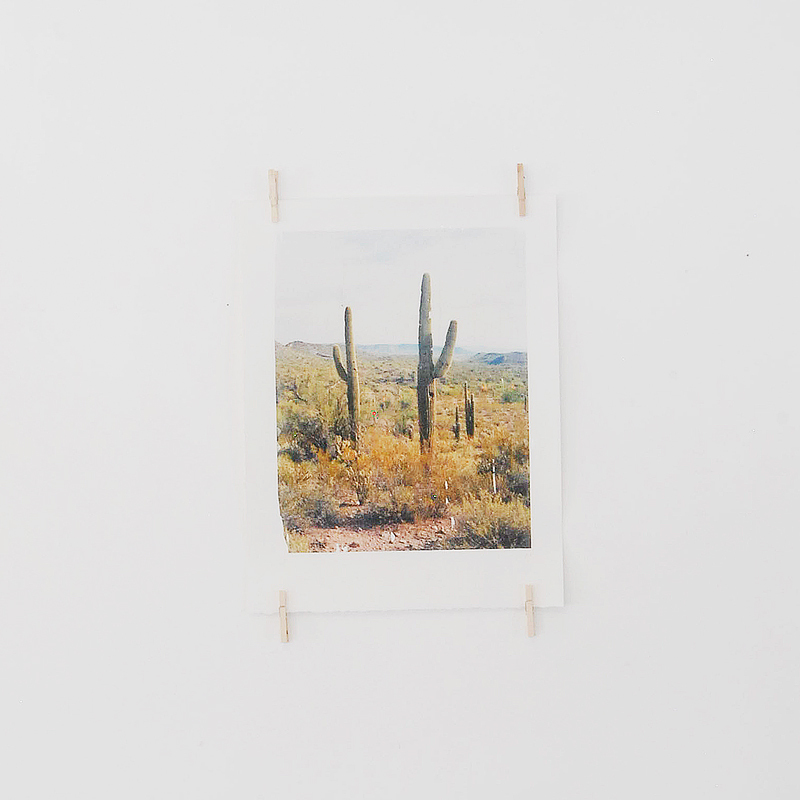 The final print is the result of transferring the image, a positive, pigment-based substance, to paper. An action process, printing sessions often occur for 8-12 hours without interruption, revealing patterns of breakdown created by the media and the human hand, bringing subjectivity into direct engagement with matter, genre. Due to the intrinsic relationship that the photograph has to representations of violence, these processes were wholly embraced as means to experience nature and materialize the obfuscated substance of environmental fallout. It’s been said that the images in a Western are ready-made, that we are always speaking within a genre. At the last point of great inequality in American society - the first Gilded Age - we imagined the American West, transferring images from literature and painting into the photograph, and motion picture film. Perhaps it is fitting that now, deep in the throes of the so-called Gilded Age 2.0, we should return. Taking the Western to the Pacific, taking the media to the limit — The Evening Pink explores timeless questions about the relationship between man, nature, and violence, in a landscape with a severely altered climate.